In the prologue, the train is silent and empty, waiting for its passengers. The passengers are waiting on the platform. Next, we read an advert. A dating agency is running a competition to win a night on the Orient Express. We get to read the profiles of two people. Before the journey, we spend time with our characters. Widow 84 year old Adele who sends her granddaughter, Imogen, on the mysterious errand; Imogen herself who has run the art gallery with her grandmother and is now at a crossroads; Riley, a photographer who is still in demand despite his age. He journeys on the Orient Express on the same date each year; Archie, a farmer, and his best friend Jay; Stephanie who has been in a relationship with Simon for three months and finding where she fits in the family with his two children, Beth and Jamie. Amidst the opulence and pampering on the journey from Victoria to Calais, issues and conflict build but also new relationships are formed. At Calais, two more characters join in the journey. One expected and one a surprise for the woman waiting inside the train. Venice works its magic on our characters with some very intense scenes. 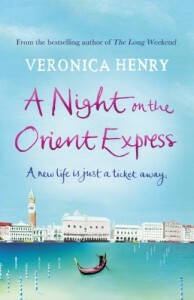 The author’s descriptions of the Orient Express and Venice let my imagination believe I was there on the train and experiencing the beauty of Venice. A Night on the Orient Express is beautifully written. I loved being involved in the lives of the characters. Through our characters we experience love in all its different hues. There’s passion, a soul bonding that could have been destructive; new love between younger characters; enduring love; the love for a best friend and familial love. There is just so much to hold your attention with real life issues. I love a book that engages the emotions totally and this really is an emotional ride (forgive the pun! ).